Dr. Surya Bhushan, holds PhD in Economics, is Associate Professor at Development Management Institute (DMI), Patna, Bihar. An alumnus of CESP, JNU, he has more than nine years of global industry experience with Accenture Management Consultancy in the marketing analytics division. He has published articles in the refereed journals on the productivity growth of agriculture in India using parametric and non-parametric methods. He has written a book recently, entitled, Agriculture and Environment in India. His current area of interest includes, Livelihoods and Well-Beings, Inclusive Business Models, Impact Assessment, Productivity Growth and Technical Efficiency Estimation, especially in agriculture. Dr. Suryabhushan brings with him nearly eleven years of experience in industry, before moving to DMI. 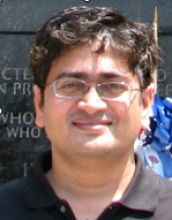 He did his doctoral studies in economics and is an alumnus CESP, JNU. He had worked in the marketing analytics domain at Accenture Digital for more than 9 years, prior to which, he had been associated with the Centre for Monitoring Indian Economy Pvt. Ltd. (CMIE) for more than a year. He had liaised with policy makers at the Ministry of Finance, Planning Commission, and the editorial team of Indian Express. Dr. Bhushan's current interests comprise Agricultural Productivity Estimation, especially in the context of parametric and non-parametric framework, and Marketing Analytics. He has published in several leading refereed journals in India, of which the most cited paper "Productivity Growth of Wheat in India: a Malmquist Approach" was published in the Indian Journal of Agricultural Economics 2005. The Indian Economic Journal (2009): “Non-Parametric Productivity Growth of Wheat in India during Post-Green Revolution”. Arth Vijnana (2006), “Productivity and Efficiency of Wheat Production in India” in 2006. Indian Journal of Agricultural Economics (2005), “Productivity Growth of Wheat in India: a Malmquist Approach”. Paper presented, “Sustainable Agriculture through Mushroom Cultivation”, at Extecon Conference in May-2017 at Hyderabad. Paper presented, “Backyard Poultry: Livelihoods Intervention in Bihar”, at 5th NoSRM Conferences on 19-Oct-2016 at Bhubaneswar. Paper presented, “Backyard Poultry: Supplementing Nutrition”, at NRLM meeting on 02-Sep-2016 at Delhi. Paper presented, “Malmquist Productivity Growth of Wheat in India during Pre- and Post- WTO Period”, accepted at International Conference on “Indian Agriculture Sector under Trade Liberalisation and WTO: Issues and Challenges”, December 11-12, 2014, Centre for WTO Studies, IIFT, New Delhi. Paper presented, “Understanding Energy Use in Indian Agricultural Production System in the Post-WTO Period”, accepted at International Conference on “Indian Agriculture Sector under Trade Liberalisation and WTO: Issues And Challenges”, December 11-12, 2014, Centre for WTO Studies, IIFT, New Delhi. Presented and awarded best paper on Environmental Impacts in Indian Agriculture in a World Bank sponsored programme at ISEC, Bangalore in 2002.